I saw this in Fowey harbour yesterday whilst out sailing with my Dad. A classic design which blends superbly with the Fowey Troy boat in the background. I like the use of the decking and garden furniture set to finish off this superb piece of naval architecture. 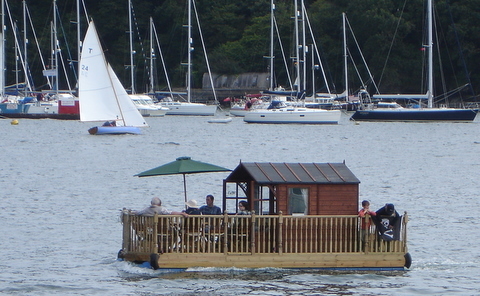 Apparently it was built for Fowey Week Regatta. This entry was posted by Chris Prettejohn on August 30, 2009 at 12:58 pm, and is filed under Fun. Follow any responses to this post through RSS 2.0.You can leave a response or trackback from your own site.